Traditional entrepreneurship literature often views entrepreneurship as an economic battle of a single person, the lonely hero! “For a long time it has been a great myth that entrepreneurship implicitly describes the battle of a lonely hero against economic, governmental and social forces” (Cooney & Bygrave, 1997). In the early 90s scholars (eg Kamm et al 1990, Müller-Böling and Heil 1994) talk about a very important but almost undiscovered field in the entrepreneurship research and namely team entrepreneurship. While a plethora of studies on individual founders and their numerous sub-issues could be found (Gartner, 1985; Hofer & Sandberg, 1986; Carland, Hoy, Boulton, & Carland, 1984; Olson, 1987), the studies on team ventures are scarce, they often lack a theoretical background or fail to even provide a proper definition of the researched object. In contradiction however to the myth of the lonely hero, entrepreneurial teams are not just more frequent than it might appear (Cooper, 1986; Teach, Tarpley, & Schwartz, 1986) but can also be tracked back to the very beginnings of the industrial revolution: Werner von Siemens and Georg Halske have jointly founded Siemens AG in 1847. Another example of a successful German team venture is the evolution of the Hoechst AG, which was founded by a team of three in 1863: Carl Friedrich Wilhelm Meister, Eugen Lucius and Ludwig August Müller. Other later examples of known and successful team ventures are Hewlett Packard, Intel, Apple, Melitta, Adidas, Haribo (Müller-Böling and Heil 1994). As is frequently the case in research, the question for a precise and generally accepted definition does not have a simple answer. Some researchers argue that this may be one reason that leads to the contradictory and some times even confusing empirical results in the field. Ensley, Carland, & Carland (1998), combine elements from other definition found in the literature and establish three conditions which identify an individual as member of an entrepreneurial team: they have either (1) jointly established a firm, (2) a financial interest in, or (3) a direct influence on the strategic alignment of the venture. This definition will serve as basis for this research. In an effort to truck down the evolution of the research in team entrepreneurship and in the framework of a Bachelor thesis in the European Business School, a research framework introduced by Lechler in 2001 was used and extended. The method used was content analysis of papers in four scientific journals for the time frame 1990-2006. The four investigated journals are: AMJ (Academy of Management Journal), ETP (Entrepreneurship: Theory & Practice), JBV (Journal of Business Venturing), and JSBM (Journal of Small Business Management). This research framework was derived from Lechler’s extended framework for the success factors of entrepreneurial teams (Lechler, 2001, p. 275) which, in contrast to earlier research, accounts for social interactions to influence team performance and ultimately venture success. In Lechler’s concept, the notion of a simple input-output function was replaced by a more complex input-interaction-output model which was used as the basis for the present study. Source: adapted from Lechler (2001, p. 275). Figure 1 illustrates the three phases of the analysis, which partly overlap in sequence during the analysis but are generally to be perceived as successive. Phase I seeks to capture all articles which were published in the above-mentioned journals over the last 16 years and constitute a meaningful contribution to the topic of entrepreneurial teams. The concept of Top Management Teams (TMT) is taken into account in consideration of the fact that founding teams can also be interpreted as such. However, since several differences can be identified between entrepreneurial teams and TMTs, only articles about TMT are taken into account, which explicitly refer to founding teams as a possible form of TMTs. In Phase II, all articles found to be relevant in Phase I are assigned to a certain subcategory. To cover the whole process entrepreneurial teams are going through, the following four subcategories were developed: Team Building, Team Composition, Team Interaction and Changes in Team Composition. Team Building contains all articles which are concerned with the formation of founding teams, for example where prospective members meet, where they search for potential members, why they choose certain persons and so on. 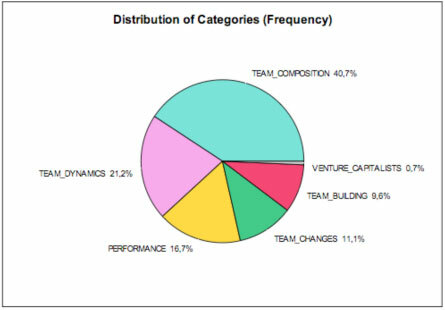 Team Composition includes all articles occupying themselves with different patterns for constituting entrepreneurial teams, for example heterogeneity in terms of skills, age or functions, differences in team size or cultural differences. Team Dynamics is concerned with all events and emotions among the group members. These may be conflicts, cohesion, norms, communication and further interactions. Finally, Changes in Team Composition addresses the events of member entry and member exit, as well as the drivers for both phenomena. Team break-ups were taken into consideration as well, but were hardly encountered throughout the analysis. In the course of the categorization process, it became necessary to develop a fifth subcategory: a considerable number of relevant articles was found to address the relation- ships between the entrepreneurial team and the venture capitalists. To take this into consideration, the category Entrepreneurial Teams & Venture Capitalists was developed. Phase III evaluates which articles investigate the impacts of the above-mentioned aspects on venture performance. Overlaps emerge due to the fact that most articles not only study the outcomes of team ventures but try to expose certain interrelations between drivers and performance as well. “Content analysis is a research technique for the objective, systematic and quantitative description of the manifest content of communication” (Berelson, 1952, p. 18). This definition by Berelson is probably the mostly cited one and claims for two important conditions: firstly being objective and secondly being systematic. Objectivity in this sense means that rules for the development of categorizations are clearly specified and traceable and not “an extension of the analyst and his or her personal biases” (Bryman, 2004, p. 182). This personal bias of the researcher is aimed to be minimized by as much. The content analysis at hand aims to make quantitative statements about a compilation of journal articles. To identify relevant articles the medium of question is searched for a certain umbrella term and its synonym concepts. Subsequently the relevant articles are classified into categories which are either predetermined or evolved during the study. In this way an effort is made to find out about the most important and most frequently researched concepts of the examined topic. The classification is thereby derived from the observed frequency of certain keywords. The main finding of this study is that team entrepreneurship as research field is remarkably low represented in the investigated journals. 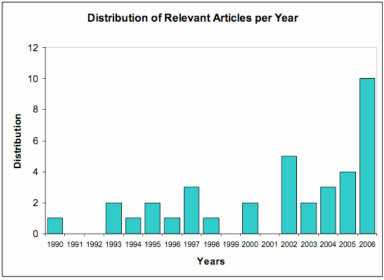 During the 16 years between 1990 and 2006, a total number of 3,487 articles were published in the journals of interest. However, only N=35 (0,01%) were classified as relevant for this specific research topic. This is a remarkably low percentage and shows that no extensive research on entrepreneurial teams was performed during the timeframe examined. 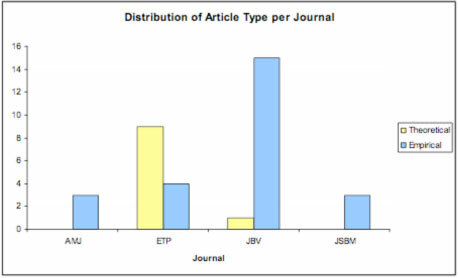 Whereas the entrepreneurial journals showed a higher density of relevant articles (JBV 3%, ETP 2,7% ), JSBM, which is not exclusively specialized on entrepreneurial firms, yields 0,4%. AMJ with only 0,2% brings up the rear. For the general distribution of articles between 1990 and 2006 no verifiable pattern could be detected. It can be claimed though that the last four years yielded a constant and increasing preoccupation with team entrepreneurship. Especially the year 2006 (with 10 relevant articles) peaks out in terms of published articles. 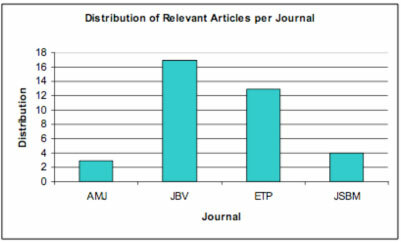 Figure 4 shows clearly that Team Composition as research field has gained most attention by the researchers. It is represented almost twice as frequently as Team Dynamics which was examined quite often as well (21,2%). Performance (16,7%) was been addressed as often as the latter two, but still exceeds Team Building (9,6%) and Changes in Team Composition (11,1%). Venture Capitalists as niche concept is only represented with 0,7% and can not compete with the other research aspects of team entrepreneurship as mentioned above. Venture performance has garnered much attention in general, but seems to be limited to successful ventures. The aspect of venture failure and its reasons is hardly accounted for in the existing literature and the analyzed articles. The distributions of theoretical and empirical articles throughout the 16 years of examination reveals that empirical research exceeded theoretical research almost during the whole period, the years 1990 and 1993 representing exceptions. The surge of empirical studies can be found in the years 2005 and 2006. Despite of all efforts to run an analysis without biases but with the most gainful outcome it has to be taken into account that certain limitations can not be neglected. First of all the issue of representation has to be nominated. Even though the time frame of sixteen years appears comparatively long it has to be taken into account that the most commonly quoted references date back to 1990 and earlier. To depict the evolution of team entrepreneurship research in exhaustive extent an analysis should start with the very first beginnings of research. This claim also concerns the sample and sample size of analysis: in this case only four journals have been researched – a fractional amount of all journals that could be identified as relevant. The analysis of quoted references indicates, that alternative journals could yield richer sources of relevant articles than the examined ones. Furthermore, it should be considered to extent the analysis to books, since the analysis of journals neglects the existence of the latter. To accurately reflect the evolution of research on entrepreneurial teams, these resources should be added to the pool of samples. Furthermore, the disadvantages of content analysis could not be dispelled. The categories which were developed to classify the articles can not properly reflect reality and consciously exclude certain eventualities. In addition the category scheme as well as the coding system was developed by one single person. Intercoder reliability could not be realized – a personal bias of the coder is therefore not excludable. This paper depicts the evolution of research on founding teams for a very limited span of time and for a very small sample of only four journals. It can therefore only be counted as small contribution to the research base on entrepreneurial teams. On the other hand it gives a hint of the limited research conducted in the field of team entrepreneurship. Prospective research should advisably examine a longer span of time and a bigger sample of analysis. A concentration on different aspects or the extension of the ones presented in this paper is advisable. As for future research, the analysis has revealed several gaps of investigation which are still waiting to be filled. The aspects of team building, team split and venture failure have hardly been addressed so far. Moreover, cohesion, shared strategic vision and team potency require further elaboration. As research findings on the established factors of team dynamics are rather divergent the assumption might be made that teams are influenced by more factors than just cohesion and communication. Bryman, A. (2004). Social Research Methods (2nd ed.). New York: Oxford University Press. Carland, J., Hoy, F., Boulton, W., & Carland, J. (1984). Differentiating Entrepreneurs from Small Business Owners: A Conceptualization. Academy of Management Review, 9(2), 354-359. Cooney, T. M. & Bygrave, W. D. (1997). The Evolution of Structure and Strategy in Fast-Growth Firms Founded by Entrepreneurial Teams, Working Paper presented at the Babson Entrepreneurship Conference 1997.
Cooper, A. C. (1986). ‘Entrepreneurship and High Technology’. In Donald L. Sexton and Raymond W. Smilor (Eds. ), The Art and Science of Entrepreneurship, Cambridge, MA: Ballinger, pp. 153–168. Ensley, M.D., Carland, J.C., & Carland, J.W. (1998). The Effects of Entrepreneurial Team Skill Heterogeneity and Functional Diversity on New Venture Performance. Journal of Business and Entrepreneurship, 10(1), 1–11. Hofer, C. W., & Sandberg, W. R. (1986). Improving new venture performance: Some Guidelines for Success. American Journal of Small Business, Summer, 11-25. Kamm, J., Shuman, J., Seeger, J., & Nurick, A. (1990). Entrepreneurial Teams in New Venture Creation: A Research Agenda. Entrepreneurship: Theory & Practice,14(4), 7-17. Lechler, T. (2001). Social Interaction: A Determinant of Entrepreneurial Team Venture Success. Small Business Economics, 16(4), 263-278. Müller-Böling, D.; Heil, A.H. (1994) Unternehmer-Teams – Eine wiederentdeckte Idee. In: Müller-Böling, D.; Nathusius, K. (Hrsg. ): Unternehmerische Partnerschaften. Beiträge zu Unternehmensgründungen im Team, Stuttgart 1994, S. 39-59. Olson, P. (1987). Entrepreneurship and Management. Journal of Small Business Management, 25(3), 7-13. Teach, R.D., Tarpley, F. A., & Schwartz, R. G. (1986). ‘Software Venture Teams’. In Robert Ronstadt, John A. Hornaday, Rein Peterson and Karl H. Vesper (Eds. ), Frontiers of Entrepreneurship Research 1986 – Proceedings of the 1986 Babson College EntrepreneurshipResearch Conference (pp. 546–562). Wellesley,MA: Babson College.